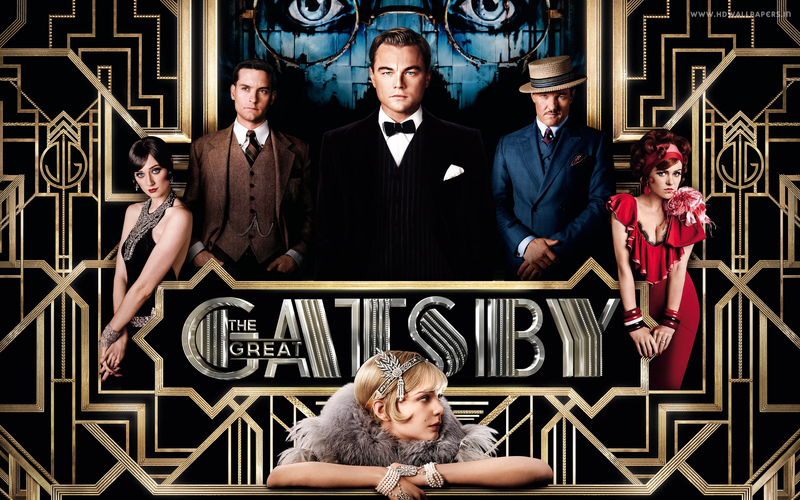 If, like me, you were a big fan of Baz Lurhmann’s re-imagining of F. Scott Fitzgerald’s The Great Gatsby, you may now be looking for locations to relive the glamour and the glitz of the roaring twenties with your equally enamoured bon viveurs. Although, at the moment, every hotel, restaurant, bar and even shops, has got in on the buzz, I’ve put together, in no particular order, my guide to the top ten art deco style ‘Great Gatsby’ haunts in London. These have already stood the test of time and will still be fabulous once the frenzy surrounding the film dies down. One of the finest art deco hotels in London, and known to be a firm favourite of F. Scott Fiztgerald when he was in town, The Savoy hosts a marvel of different venues under the same roof in order to party uninterrupted Gatsby-style. Start the evening at The American Bar with a Gin Rickey, Fitzgerald’s tipple of choice, before hopping over to the newly opened Kaspar’s Seafood Bar & Grill, formally the site of the hotel’s ill-fated River Restaurant. Named after the hotel’s lucky black cat, today Kaspar’s brings Gatsby’s era to life with glamorous glass chandeliers, geometric floor tiles and marble counter tops. With its black and gold geometric floor, marble pillar bases, wrought-iron railings and glossy brasserie tables, The Balcon at the wonderfully renovated grade II listed Sofitel St James would be the perfect backdrop for a boozy lunch with Gatsby and co. As well as boasting a charcuterie bar and designated champagne balcony, The Balcon has a super-star central London location; Trafalgar Square, Haymarket and Piccadilly are all just minutes away. 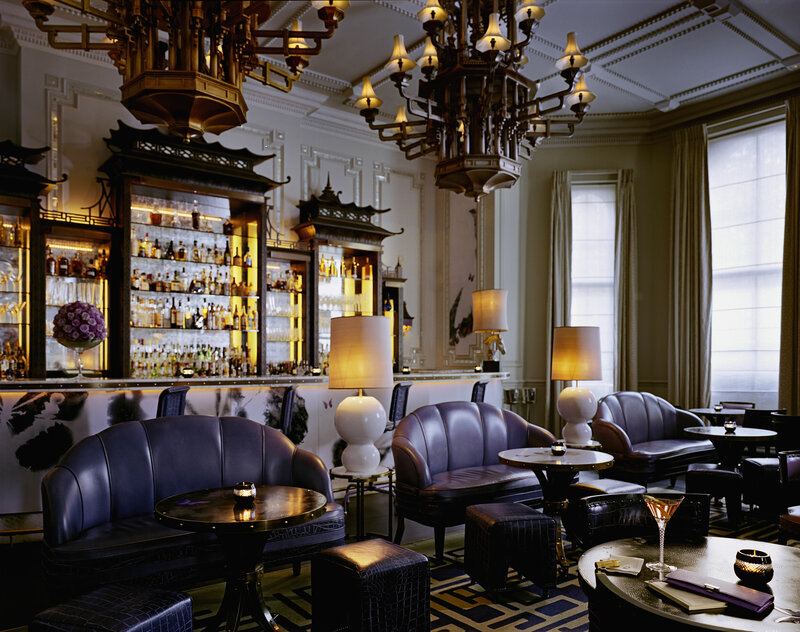 If you’re still thirsty, move along to the hotel’s equally glamorous St James Bar which is inspired by Coco Chanel’s 1920s Paris apartment. 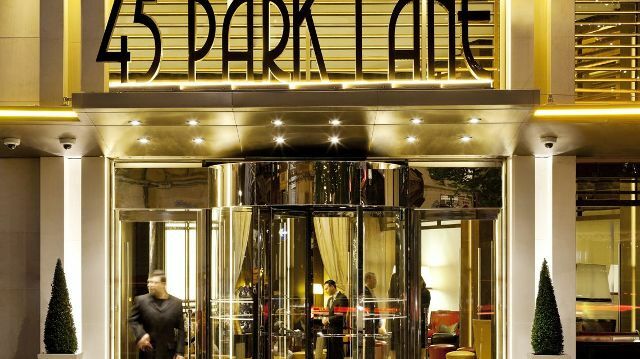 45 Park Lane opened as a boutique hotel with world-class facilities in 2011. As little sister hotel to The Dorchester, just across the way, guests at 45 Park Lane can use The Dorchester’s luxurious spa, gym and restaurants to their heart’s content. 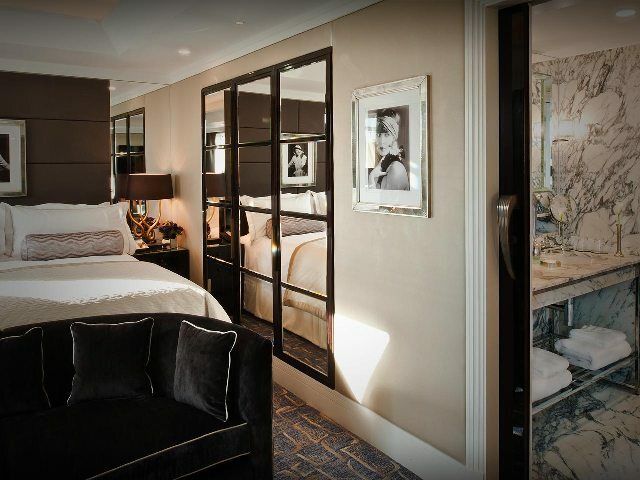 Rooms at 45 Park Lane are where things really start to get all ‘Great Gatsby.’ Designed by interiors guru, Thierry Despont, they are perfect blend of contemporary luxe with art deco influences. You can expect glossy dark woods, duck egg walls, black and white photography on the walls and a flapper-fantastic diamond motif flooring. Consistently voted one of the world’s best bars, Artesian Bar at the The Langham hotel manages to convey the glamour of Gatsby’s opulent and fantastical parties. Designed by David Collins, Artesian’s piece de resistance is the sky-high oriental-style open drinks cabinets as well as the Asiatic wooden chandeliers. Purple leather banquettes, cocktails to die for and endless high ceilings make a trip to Artesian Bar a night to remember. Also, unlike a lot of fancy London bars, Artesian manages to avoid attracting the usual crowd of brass city bankers and their tag-along wags. 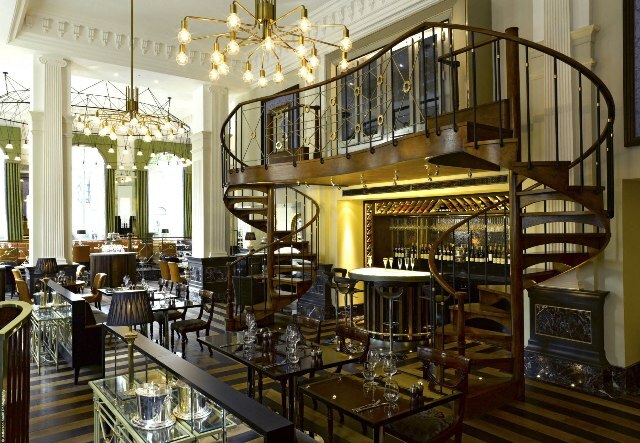 Claridge’s is known as London’s art deco hotel, but no where is this more apparent than The Fumoir. A small and sumptuous space squeezed between Claridge’s Bar and Gordon Ramsey at Claridge’s, The Fumoir feels like a slice of history and is a loving homage to the 1930s. 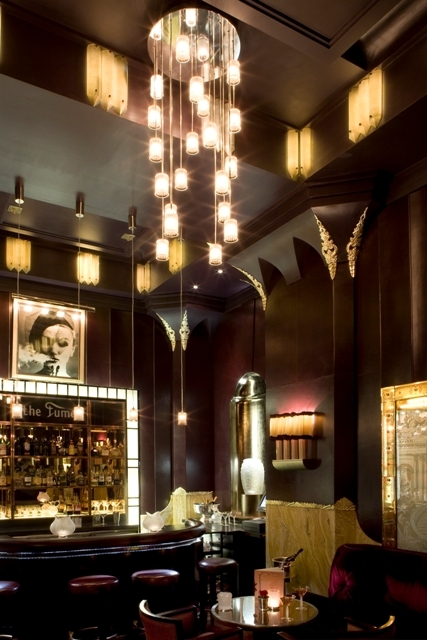 Plush red velvet banquettes, a half moon bar, fringed lamps, atmospheric black and white portraits and gilded gold embellishments (and look out for the bar’s original 1930s lalique panel)all combine to perfectly recreate the hedonism and dark glamour of Great Gatsby’s era, right in the heart of Mayfair. 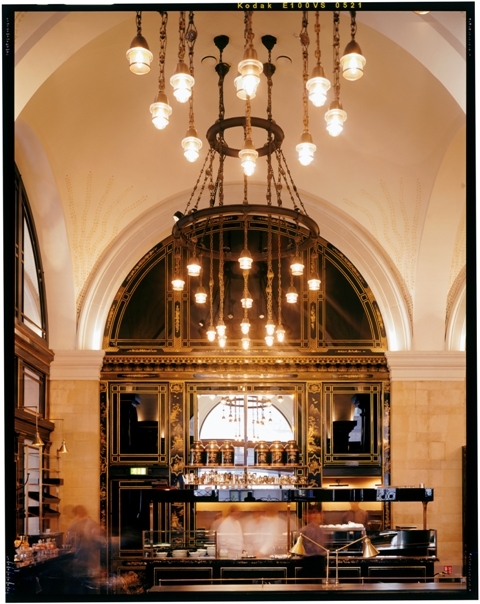 Like Gatsby himself, the site of The Wolseley has a past well versed to reinvention. Opened in 1921 on Piccadilly, The Wolseley started life as the classy show-room of Wolseley Motors Ltd. The design, by architect William Curtis Green, was typical of the day, incorporating domed ceilings, grand pillars and graceful arches. Bad business caused Wolseley Motors to close and, in 1927, the site opened once again, this time reincarnated by Curtis Green as Barclays Bank. Many of The Woseley’s features today hail back to its origin, including the black lacquer banking counter. Now a famous outpost of the Corbin & King empire, The Wolseley is the perfect place to come and live out some Gatsby-esque fantasies, even if it is just on your lunch break. Look out for Corbin & King’s latest venture, an art deco hotel, The Beaumont, opening later this year. One of London’s hottest spots, judging by the high-profile faces constantly photographed stumbling out of the door (Kate Moss is a regular), China Tang at The Dorchester is the creation of David Tang, founder of the famous China Clubs in Hong Kong, Singapore and Beijing. Serving both delicious and authentic Cantonese food and cocktails, China Tang channels the art deco era of the 1920s and 1930s with Chinese lacquer screens, chinoiserie and glossy wooden panelling. 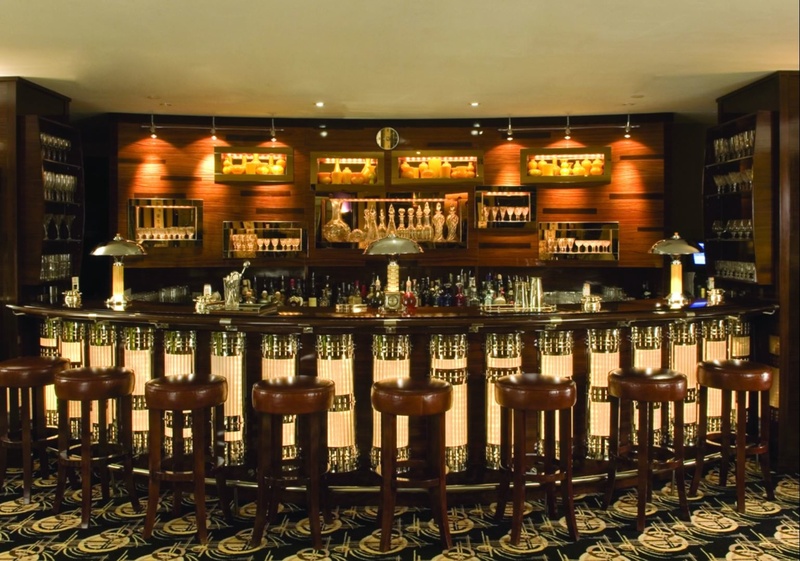 To help conjure up the good times, China Tang puts on 1930s live jazz every Tuesday in the bar – don’t miss it! 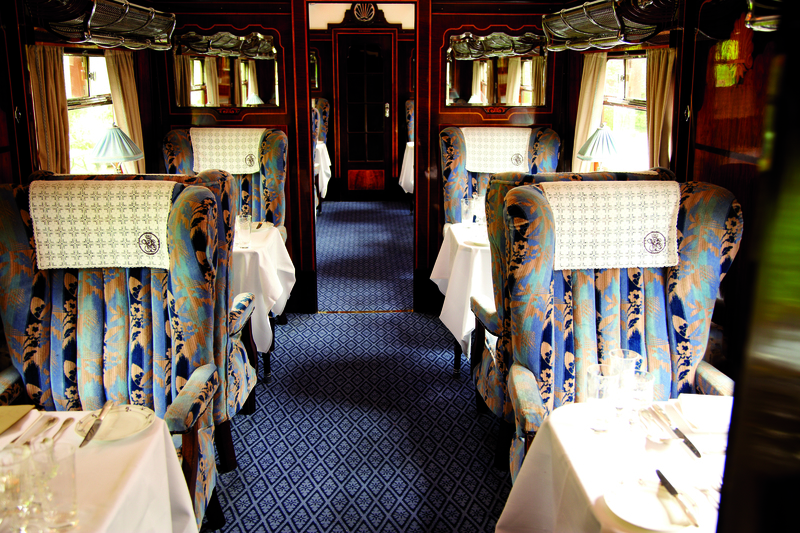 Sister train to the Venice Simplon Orient Express, The British Pullman is a train offering luxury day-trips in style that leave from London Victoria. Celebrating the golden age of travel, the British Pullman is a series of vintage carriages that were once part of the 1920s trains, the Brighton Belle and Golden Arrow. To really get into the Gatsby spirit of murder and intrigue, the train’s Murder Mystery Lunch couldn’t be more perfect. What with a mystery death, a gourmet five-course lunch, champagne corks popping and wine flowing like there’s no tomorrow, your carriage will quickly resemble a ‘Great Gastby’ party. Another suitably glamourous journey is ‘The 1920s Dinner and The Ritz’; dressed up in your 1920s gear, this champagne-drenched themed dinner on the British Pullman ends with a stay at The Ritz. 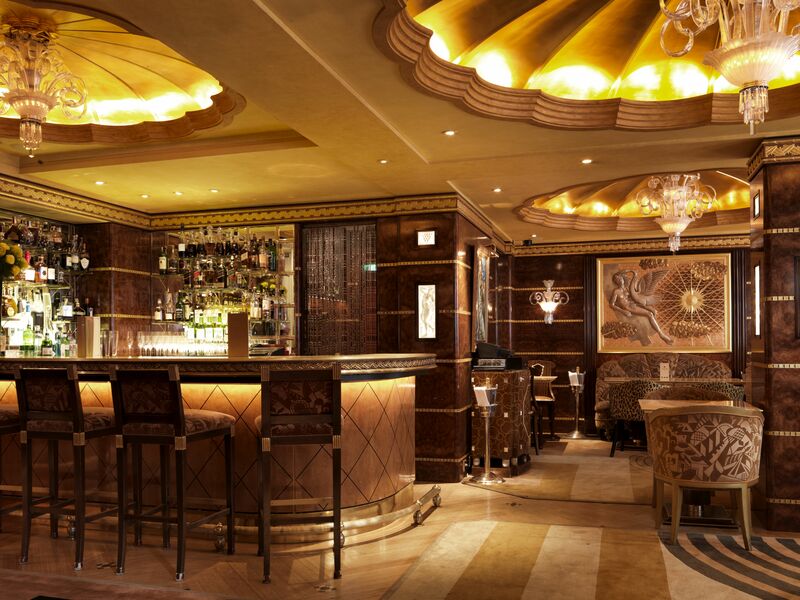 Named after one of Paris’s most fashionable streets, The Rivoli Bar at The Ritz was never going to be a shabby affair. 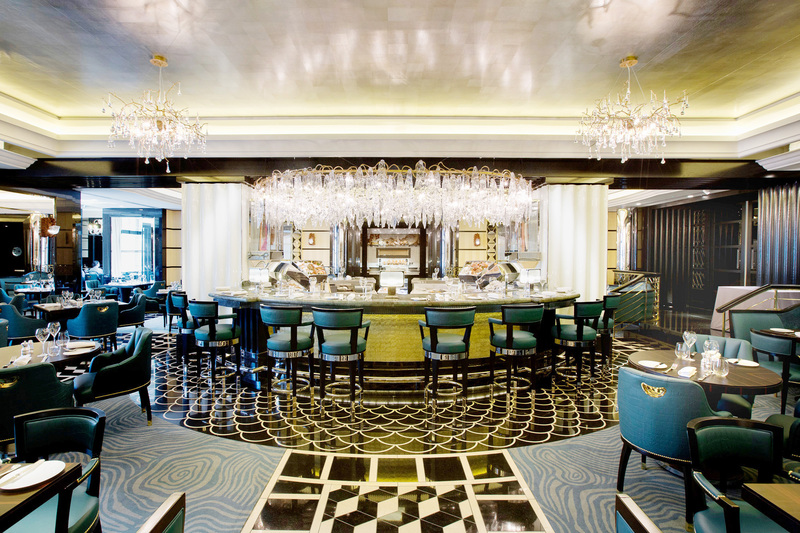 Re-opened in 2001 as a temple to all things art deco, and designed to resemble the bar on the legendary Venice Simplon-Orient-Express, the Rivoli Bar is the creation of interior designer Tessa Kennedy. In true Gatsby style, The Rivoli bar is the perfect place for champagne-toasting amidst its leopard-print chairs, bold geometric shapes, gold-leaf details and glowing chandeliers. If you are looking for the ultimate stamp of approval, it is a known fact that F. Scott Fitzgerald loved to drink champagne at The Ritz. What did you think of the movie? I’d love your tips on top tips on Gatsby-esque locations around the world.. let me know!